“When does the game stop and the terror begin?” It’s best to catch this compelling psychological horror film late at night when its subtle power can slowly unfold on your psyche. 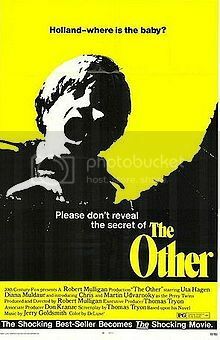 Directed by Robert Mulligan (Summer of ’42), The Other was scripted by Tom Tryon from his own 1971 novel of the same name. Chris and Martin Udvarnoky (in their only film appearance) star as 12-year-old twins “Niles and Holland Perry,” who live on a Connecticut farm during the Great Depression. Niles is the good twin, a dreamer (who may or may not have psychic abilities), while Holland has a mischievous, adventurous streak that frequently gets them both into trouble. The twins have the run of the farm since their mother (Diana Muldaur) is a recluse who rarely leaves her upstairs bedroom. Niles carries around a tobacco tin with several trinkets, including a family ring and severed finger (not kidding!). A string of horrifying “accidents” on the farm – including obnoxious cousin “Russell” (Clarence Crow) being impaled by a pitchfork after jumping into a haystack – lead the twins’ kindly grandmother “Ada” (Uta Hagan) to slowly believe that one of the twins may in fact be the essence of pure evil. The ending – which references the Lindbergh tragedy – is truly disturbing. Look for John Ritter, in one of his earliest film appearances, as “Rider.” One of my favorite scenes is when the twins sneak into the carnival freak show and they are scared away by “The Man with Two Faces” (Robert Melvin). Useless Trivia: Tryon starred in I Married a Monster from Outer Space (1958) along with Gloria Talbott.